I am, as many are, addicted to the Simpsons. I have the DVD sets and have watched all the episodes uncountable times. I’ve played the trivia games and quote the Simpsons daily. 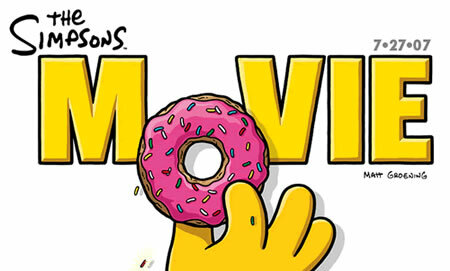 So it is with great regret that I have to tell you the Simpsons Movie is not worth going to see in the theatre. I fully expected to write a totally biased review praising the genius of Matt Groening and that the Simpsons franchise is live and kicking, despite what others were saying leading up to the debut. I expected when I went to the theatre that there would be 80 or so other people just like me ready to laugh out loud at the stupid antics of the Springfieldians. Unfortunately that didn’t happen. That’s not to say there weren’t times when I was laughing, but it wasn’t a non stop laughfest. I didn’t get the feeling like the audience was really into this movie. I find it very difficult to understand why after 18 years of developing so many funny characters that they made a movie focused on just Homer. Granted Homer is the star of the show and constantly makes me laugh in the series, but there was literally nothing out of Mr. Burns, Carl, Lenny, Moe, Dr. Hibbard, Dr. Nick Riviera, Krusty the Clown, or Bart’s nemesis Sideshow Bob. I understand that it is difficult to come up with something new since just about everything has been done in the 18 years it has been on TV, but again I always believed there was one more hidden story that would be the crowning moment in Simpsons history. I think the sub plots were too serious, Bart looks to Flanders for a father-son relationship he’s never had with Homer. Marge breaks up with Homer and takes the kids away and a boy named Colin, which Lisa has a crush on, is introduced for no apparent reason. If you still want to see this movie, which any Simpsons fan should, then wait for it to come out on DVD. You will probably have more fun with your friends watching it at home on the weekend.